Well, time to see some wildlife. Up until this point, I had not spent much time experiencing nature. Before studying medicine, I devoted seven years to plant and animal biology which made me aware that not all organisms have a single heart or use hemoglobin as an oxygen transport molecule. Some excursions into nature were necessary. In the spirit of my journey - freedom - I only wanted to see uncaged animals in their free state. Ecuador was the perfect country in which to do this. The bus ride to Ecuador was long, but uneventful. I spent much of it reading a book called Open Veins of Latin America written in 1971 by an Uruguayan author named Eduardo Galeano. This book is famous in South America. In it, Galeano vehemently describes the detrimental effects of European and later US economic exploitation on South America. He argues with passion and outlines the history of the continent over the last several hundred years better than any other book I have read. However, although Galeano outlines the negative effects of exploitation on South America, he does little to address a solution. To my mind, any problem requires not only an identification of the issues, but also an attempt at a solution, yet Galeano merely suggests in the final pages of the book that some kind of socialist revolution is needed. Still, if you want to read one book that depicts the history and psyche of South America better than any other book that I know of, this is it. After crossing the border, I got off the bus in the city of Guayaquil. I arrived in the evening and felt the change in climate immediately; despite it being winter, it was hot and humid here compared to the cool overcast weather in Lima. I met a talkative group of fellow travellers in my hostel and stayed up to swap stories before retiring to bed. In the morning, one of the hostel owners loaned me a city map and told me to take the bus into the city rather than walk, as it was a long walk through dangerous outer city suburbs with nothing good to see. However, I wanted to see as much of Guayaquil as I could in a day, dangerous or not. So, after thanking him for the map, I took a leisurely stroll into the city. The first two hours consisted of dusty outer city suburbs, dubious neighbourhoods, and freeways, but I enjoyed the walk nonetheless, and finally arrived at the city centre. With a metropolitan population of nearly four million people, Guayaquil is the largest city in Ecuador and the nation´s main port. Before this trip, I had never heard of it. However, it is famous in Latin American history as the site of the Guayaquil Conference on July 26, 1822, where the two liberators of South America, Simon Bolivar and Jose de San Martin, had a private meeting to discuss the future of the continent. Despite their common goals and mutual respect, they could not agree on how to organize the governments of the newly liberated countries (Bolivar wanted republics while San Martin preferred monarchies). The meeting ended with San Martin abdicating his powers, returning to his home country of Argentina, and ultimately retiring in France, while Bolivar carried on. From my point of view, Guayaquil had a few nice places to see, but nothing outstanding. I ambled along the main streets for most of the day. There were some decent parks. The main negative feature was the river, which was a muddy brown colour. For lunch, I sampled the chifa, a kind of hybrid Chinese-South American cuisine popular in Peru and Ecuador. Chifa was created by Chinese immigrants who substituted expensive imported original Chinese ingredients with cheaper local ingredients available in Peru and Ecuador. I ended up eating chifa a lot in Ecuador. At the end of the day, I walked back to the hostel for another evening of conversation with the other hostel guests. I met an interesting girl named Samuela from Malta, and we stayed up for a few hours discussing a variety of things. Two days later, I hopped on a plane to the Galapagos Islands. Famous in South America, Open Veins of Latin America depicts the history and psyche of the continent better than any other book that I know of. It was suggested that I avoid the dusty outer city suburbs of Guayanquil, but wandering through the less affluent areas provides a more realistic view of any city. A giant sculpture of a machin monkey, created by Ecuador artist Juan Sanchez, guards the Santa Ana tunnel entrance. One of the main streets of Guayaquil, named after - you guessed it - Simon Bolivar. Yet another large statue of Simon Bolivar watches over Seminario Park. There are statues and streets dedicated to Bolivar all over South America. Chifa is a hybrid Chinese-South American cuisine that uses local ingredients to replace the original Chinese ingredients. To reach the Galapagos Islands, I had to break one of my rules, which was to travel only by land or sea. Taking a boat out to the islands would have been time-consuming. You have to break the rules once in a while. To see the Galapagos Islands, you can either join a boat with a guide and cruise the islands for a several days or arrange individual day trips. I decided to join a boat as a lot of the best islands are off limits to day trips, managing to secure a last-minute spot at relatively low cost in a boat called the Nuevo Flamingo, which had a diverse itinerary that took in most of the central and southern Galapagos Islands over eight days, including Espanola Island, an place that I had a particular interest in seeing. The Nuevo Flamingo was, at 51 feet in length, small compared to most other ships cruising the islands. She had a five-man crew and carried ten passengers. For these reasons, the Nuevo Flamingo was tourist class, the lowest class of cruise ship, but she was also the cheapest, and I had no need for luxurious amenities. The Galapagos Islands are a cluster of islands (eighteen main islands and three smaller ones) located nearly one thousand kilometers west of continental Ecuador. They were discovered accidentally in 1535 by Fray Tomas de Berlanga of Spain who was sailing to Peru when the winds died and he drifted off course (although it should be mentioned that pre-Colombian people likely visited the islands even earlier than Berlanga). The Galapagos Islands are famous for the enormous numbers of endemic species living within and around them. Moreover, each island is slightly different, resulting in subtle variations across species from one island to the next; for example, the shape of the mockingbird beak evolved differently on each island as a response to the different vegetation found on each island. Galapagos achieved fame in 1835 when the Beagle sailed through, carrying a 26 year old naturalist named Charles Darwin. Darwin made numerous observations on geology and biology over his five week tour of the islands, and the subtle differences in animals that he noted from one island to the next helped lead him to his eventual formation of the theory of natural selection, a theory that still forms the central tenet of the study of the evolution of life today. I met my guide and the other passengers at the airport on Santa Cruz Island, the most central and second-largest of the Galapagos Islands. We headed towards the boat which was anchored outside of Puerto Ayora, the largest town in Galapagos with a population of 12,000 inhabitants. It was a typical tourist town. Our guide, Alfonzo, was an interesting guy. Despite the fact that I had bought the lowest class of cruise, he was a level three guide - the highest class. I discovered that Alfonzo preferred to work with a smaller company, a smaller boat, and with fewer people, and for these reasons he did not seek employment with the larger ships. He was more about the passion than the money, and was critical of many management aspects of the islands, particularly with regards to the actions of many of the other guides. I liked him immediately. The other passengers were also great people and we all got along immensely. I felt that the days ahead would be good ones. We boarded the boat and commenced our voyage. The voyage of the Nuevo Flamingo lasted for eight days. Every day we sailed to a different island. A typical morning would consist of breakfast, a two hours of walking around an interesting section of the island - with Alfonzo explaining to us the evolutionary and behavioural characteristics of each animal in illustrious detail - and one hour of snorkelling around a particular point of interest. After lunch, the afternoon would consist of another walk at a different area of the island followed by either a dinghy boat ride or another hour of snorkelling. Dinghy boat rides consisted of us puttering around an area of wildlife where land access was difficult, accompanied by Alfonzo and one of the crew members, a fellow named Lenin (his father had been an ardent communist; Lenin also had a brother named Stalin). Dinner was delicious and involved lively conversation with the other passengers. Over the eight days, we encountered so many different plants and animals that to discuss them all here in sufficient detail would be difficult. Hence, I will only mention the highlights of each island. The first day was a short one and involved solely a visit to the El Chato reserve on Santa Cruz Island to see the Galapagos Giant Tortoises (tortoises are similar to turtles, but differ in that they live mainly on land, cannot swim, and are largely herbivorous). On the way there, Alfonzo stated that ¨the Galapagos Islands may be a part of Ecuador, but they are for everybody¨. I liked that. When we arrived at the reserve, there were giant tortoises everywhere. I found out that the reserve was actually a farm, and the farmer had decided that allowing the tortoises to roam around freely on his farm was more profitable than relying on crop production alone. We saw at least twenty tortoises over two hours, all huge, and many of them over one hundred years old. It is said that giant tortoises owe their large size to island gigantism, a phenomenon thought to result from evolution on a small island as a result of reduced pressure from predators - the reduced predation pressure allows smaller species to evolve larger bodies than their mainland cousins. Giant tortoises are amongst the oldest living creatures in the world. The second day involved a trip to several points on Floreana Island, one of the larger southern islands in the Galapagos. Floreana Island is relatively flat with a few hills. During our walk, we saw many sea lions and a wide array of birds, and snorkelled later on with sea turtles, rays, and many colourful fish. During our snorkelling, one small sea lion pup came up to us and played with us for almost an hour. Sea lions differ from seals in that they have earflaps, are better at walking on land, and swim a bit differently. They are intelligent and easy to train, and the pups love to play, although Alfonzo did warn us to keep a respectful distance from large males and pregnant females. This sea lion pup had neverending energy reserves and was extremely fun to swim with, teasing us relentlessly by swimming upside-down as well as pretended to charge someone and then veering away at the last second. In the afternoon walk, we came upon some sleeping flamingos on the island. They woke up as we approached, but did not mind us standing right beside them to take a few pictures. Unlike the James´s Flamingos I had seen in the Andes Mountains of Bolivia, these were American Flamingos, a different species and the only species that naturally inhabits North America. These flamingos didn´t even bat an eyelid as we stood beside them. (1) Right after landing, we stumbled upon a female sea lion who had just given birth a couple of hours before. Her baby´s eyes had not even opened yet. We gave them a wide berth. (2) There were hundreds of marine iguanas, a marine reptile unique among lizards in that it can live and forage in the sea. It is thought that these iguanas initially migrated over to the Galapagos Islands by some kind of natural sea raft (interestingly, there are no amphibians native to Galapagos - they would not have been able to survive for several weeks to months on a sea raft, too dry for them). (3) We encountered countless birds known as ¨boobies¨, a kind of seabird that hunts fish by diving at high speed into the sea. Facial air sacs under their skin protect them from the impact with the water. There were many Nazca Boobies as well as the more well-known Blue-Footed Boobies; the latter were easy to recognize by their bright blue feet. We glimpsed one male performing a mating ritual as well. During the mating ritual, males display their feet in an elaborate fashion as they strut before the female. Bright blue feet are considered more attractive. There were too many animals to list on and around Espanola Island, but briefly, we witnessed short-tailed lizards basking in the sun, waved albatrosses taking off from clifftops, Galapagos hawks silently watching over the land, and Sally Lightfoot crabs scuttling along the rocks. During the second snorkelling trip of the day, I swam and dove with a gang of rowdy sea lion pups in a large cave. It was so dark that I could hardly see them; they appeared as streaking shadows in the darkness. In the afternoon a huge humpback whale casually approached us, but after giving us a show for ten minutes, vanished into the sea. In the late afternoon we went to Gardner Island, a tiny island off the coast of Espanola Island. I fell asleep on a white beach, and was awoken by a little sea lion bumping my feet with his (or her) snout. This was followed by several minutes of barking, after which the sea lion triumphantly ambled a few meters away and flopped into the sand. I am still not sure whether I was in his (or her) spot, or whether the sea lion just wanted to say hello. After beautiful Espanola Island, the fourth day was spent at the relatively tame San Cristobal Island. We stopped at Puerto Baquerizo Moreno, the capital of the Galapagos Province with a population of 5,600 people and a tourist town (like Puerto Ayora, only smaller). The one unique thing about Puerto Baquerizo Moreno was that the sea lions appeared to have taken over sections of the town - sea lions sleeping on the benches, sea lions sunbathing in rowboats, and sea lions roaming the docks. It was a bit bizarre, but it provided a nice distraction from the other mundane aspects of the town. In the afternoon, we snorkelled with sea lions and a large ray. (1) The Galapagos Hawk, a large hawk endemic to the Galapagos Islands and the top of the food chain. The hawk hunts insects, lizards, snakes, rodents, tortoise and sea turtle hatchlings, and even young marine and land iguanas. I was able to get with one or two meters of these birds without them paying much attention. (2) The Galapagos Land Iguana, also endemic to Galapagos, but not quite the top of the food chain. These iguanas allowed us to watch them at a distance of less than half a meter. The majority of their diet comes from eating the prickly pear cactus; I watched one fellow find a cactus leaf, clumsily scratch away the spines with his forelimb, and take a few bites of cactus. It was a slow process. In addition to these two animals, we spotted lots of brown pelicans and mockingbirds on Santa Fe Island. Our snorkelling trip was scenic and we glimpsed a few white-tipped reef sharks in a shallow pool. The sixth day involved a walk on North Seymour Island, an island characterized by small bushy vegetation. 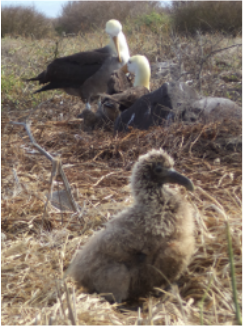 There were plenty of land iguanas and other interesting creatures, but what made this island stand out the most were the enormous numbers of frigatebirds. The most distinctive feature of this bird is the gular pouch of the male, a red area of featherless skin between neck and bill. It is inflated with air to attract females during courtship displays. We witnessed several females checking out the males with their inflated gular pouches; sometimes they were impressed, sometimes not. The snorkelling at North Seymour was particularly good, and we came across lobsters, parrot fish, huge schools of tropical fish, and a few rays. Rays are cartilaginous fish that are thought to be closely related to sharks, although they can be differentiated by their flat bodies, fusing of the pectoral fins to the head, and ventral gill slits. The last two days of our voyage involved visits to several spots along Santa Cruz Island. Many more animals were seen, but there was quite a bit of overlap from the previous islands by now. I probably enjoyed the time at sea more than anything else during the final days. At any rate, eight days passed by quickly, and before I knew it, the voyage was over and I found myself back in Puerto Ayora. I had a couple of days to kill, so I thought it might be nice to do some scuba diving. I compared the prices and itineraries at a few dive shops and found a boat that was going out to a place called Gordon´s Rocks the next day to see hammerhead sharks. Hammerhead sharks are cool. Their head is flattened laterally into an unusual shape that looks like a hammer. Several reasons have been proposed for the evolution of this head shape. Possibly the most plausible reason is that the positioning of the eyes on the sides of the hammerhead provide the shark with 360 degree vision in the vertical plane, allowing them to see above and below them at all times. I was keen to see a few of these sharks. I signed up and went out the next day to Gordon´s Rocks. The weather was rough, with waves several meters high; consequently, many diving boats had decided not to go out that day. Ours did though. One of my Israeli friends from the eight day voyage, Amir, was on board, as well as a talkative and knowledgeable Swedish couple, Martin and Maria, both marine biologists. They had a huge underwater camera with them that must have been half a meter in diameter. After jumping into the water and getting below the surface, things got calmer, but the strong currents continued to jostle us during the dive. We descended to 30 meters (90 feet) and were instantly greeted by a group of seven or eight hammerhead sharks. These sharks were over three meters (nine feet) long, and boy were they fast. They swam close, almost within arm´s reach of me a couple of times. We stayed down for 40 minutes. After returning to the boat for lunch, we went down for a second 40 minute dive and found more hammerheads, as well as rays and sea turtles swimming lazily about. A great couple of dives.The boat ride back to Puerto Ayora was treacherous as the weather had not improved, and the boat came smashing down on the water several times. It felt like we were landing on concrete, and I wondered if the fibreglass hull could take it. I found out the answer the next day, as future dive trips by our company had been cancelled; apparently, the hull had indeed cracked as a result of the rough seas. My final day in the Galapagos Islands was a lazy one, I went for an introspective saunter over to the beautiful Tortuga Bay. This is a white sand beach with a rougher section used by surfers, and a calmer section used by kayakers. In the evening, I met up with my Israeli friends, Shay and Amir, and we had the usual good time. It was great to see the Galapagos Islands. The animals were uncaged and free, and took no notice of us (actually, not all of the animals in Galapagos are free; there are small areas where animals are kept in captivity for breeding purposes). 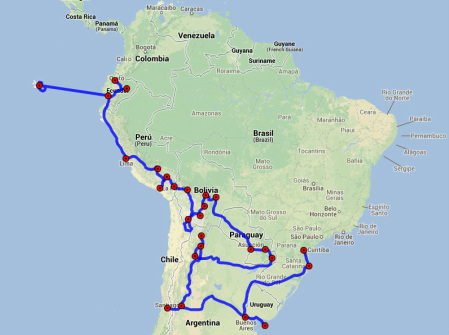 The one down side to Galapagos is that it was by far the priciest region of South America that I visited. After giving it some thought, I decided to travel to the interior of Ecuador to pay a visit to the Amazon Rainforest. The Nuevo Flamingo awaits us in the harbour of Puerto Ayora on Santa Cruz Island (day one of the voyage). Here I am with a Galapagos Giant Tortoise. You had to approach them from behind, otherwise they freak out and retract into their shell (day one). Floreana Island is relatively flat with a few hills (day two). Most of these sleeping American Flamingos woke up briefly to examine me as I approached, but then went back to sleep (day two). I am two meters away from this elegant American Flamingo (day two). Espanola Island is flat and rocky, with large bays and cliffs (day three). A bunch of marine iguanas lie in the sand beside me (day three). Marine iguanas basking in the sun, cliffs in the distance (day three). In the background, a pair of Nazca Boobies care for their chick. In the foreground, this chick appears to be alone, no parents in sight (day three). This Blue-Footed Boobie's feet are quite blue, although many had bluer feet than this. Bright blue feet are considered more attractive (day three). Our stalwart guide, Alfonzo, ponders where to go next. This humpback whale paid our boat a visit for ten minutes. Even in Galapagos, it is not always easy to sight a whale (day three). This little sea lion bumped my feet with his (or her) snout while I was asleep on the beach. This was followed by several minutes of barking. The best moments are often unplanned (day three). Me with Reuben and May from Malaysia, and Simon and Lore from Germany. Reuben and May were on their honeymoon (day three). Sea lions sleeping on a bench in the middle of Puerto Baquerizo Moreno on San Cristobal Island. There were sea lions all over this town (day four). A sea lion gracefully glides under the surface of the water (day four). Santa Fe Island has a lot of brush and giant cactus trees, in addition to loads of animals of course (day five). These Galapagos Hawks stood silent vigil over several sections of our path. Human seemed to be of little interest to them (day five). The Galapagos Land Iguana obtains 80% of its diet from the prickly pear cactus. This guy took a few minutes to scratch away the spines before eating the soft cactus flesh (day five). I am duck-diving during one of the snorkelling sessions (day five). North Seymour Island is a small island with bushy vegetation (day six). The Galapagos Land Iguana varies in colour and morphology among the different islands. Compare this guy to the one above (day six). The red gular pouch of the male frigatebird is inflated with air to attract females during courtship displays (day six). A ray lies quietly on the bottom of the seafloor (day six). Hanging out on the Nuevo Flamingo with Emma from the UK, Maria from Denmark, and Shay and Amir from Israel (day seven). A beautiful sunset beckons us back to where we started, and signals the end of our voyage (day seven). Upon landing in Guayaquil, I had no fixed plan on where to go. I knew I wanted to go to the rainforest, but there was a lot of rainforest, and I did not know much about the jungle towns. There was the option of doing a multi-day tour in a jungle lodge, but I wanted a break from itineraries and agendas. So, I decided to play things randomly for a while and hopped on a bus to a jungle town called Puyo. After a crowded and uncomfortable overnight bus ride, I arrived in quite a different environment. Puyo contains 35,000 people and is beside the Puyo River, a tributary of the Pastaza River that connects to the Amazon River. Puyo means ¨cloudy¨ in the Quechua language. It is a good name for this town; pouring rain greeted me on arrival. After getting off the bus, I started walking in no particular direction. There were a lot of ramshackle buildings in the first direction I chose, so I switched directions and after twenty minutes arrived in the town centre. I scoped out the town for a few hours and found a nice hotel for ten US dollars (they were all cheap). By evening, my synopsis of Puyo was two-fold: on the positive side, it was not touristy - I only saw two other obvious foreigners in town - but on the negative side, there was not much to do. I caught a bus north to another jungle town, Tena, the next day. Like Puyo, Tena also has around 35,000 inhabitants. Once again I ambled along the city streets for a few hours, checking out local restaurants and stores, but my synopsis this time was one-fold: Tena was similar to Puyo, though perhaps a little more touristy. Moreover, it rained even more than in Puyo. I felt that perhaps I needed to change tactics and visit a smaller town, so I caught yet another bus to a tiny jungle town called Puerto Misahualli. It was an adventure in itself searching for the bus to Puerto Misahualli in the pouring rain. Suffice to say that it was nowhere near the bus terminal and I found it only after asking for directions from a number of people (the first person, a police officer, gave me incorrect directions). I found it eventually, and upon boarding perceived that I was the only foreigner on the bus - a good sign. We arrived in Puerto Misuahalli an hour later. With less than 2,000 inhabitants, Puerto Misahualli is small. It was the best of the jungle towns that I visited, being surrounded by rainforest and consisting of a small town square with a bunch of capuchin monkeys running around the streets. These monkeys were amusing, especially when they ran on two legs. I found a great place to stay called Banana Lodge, a five minute walk outside of town on the edge of the Napo River, a major tributary of the Amazon River. After meeting my hosts, Eduardo from Ecuador and Ana from Russia, I headed into into Misahualli to see if I could find anyone to take me down the Napo River and into the jungle. I spoke with a few different guys and found one gracious fellow named Carlos who offered to take me down the river and show me the jungle with two other people the next day. I mentioned that I wanted to learn more about the Amazon Rainforest, so Carlos said no problem, he knew a local fellow named Gregorio who lived by the river - he could drop me off at Gregorio´s place and I would spend the next couple of days in the forest with him. Sounded good to me, and the fee was modest. It was also a good opportunity for me to learn new Spanish words, as both Carlos and Gregorio could only converse well in Spanish. That night, I had a local dinner of tilapia fish with yuca, a potato-like root that is a popular staple food in Ecuador, as well as a batido, a beverage similar to a smoothie (that tastes just as good). The next morning, the rain finally let up - my one sunny day in the Amazon Rainforest. I met Carlos at his house and, after trading in my runners for a pair of rubber boots, met the other two passengers, Alex from Spain and Nat from Ecuador, as well as Cairo, a young guy helping Carlos. After heading down the Napo River for an hour, we got off the boat and entered the jungle. Carlos explained that this part of the Amazon Rainforest had both primary and secondary rainforest. Primary rainforest is untouched, pristine forest, with a full ceiling canopy and much biological diversity. Secondary rainforest, on the other hand, has been disturbed in some way, either by humans or another natural event; generally, it has a less developed canopy structure, smaller trees, and less biodiversity. Carlos took us through the jungle and showed us butterflies, salamanders, caterpillars, and several species of trees. It was a nice walk, but not mind-blowing. After our walk, we went ¨tubing¨ down the Napo River. For the uninitiated, tubing is the act of riding on top of an inner tube through (usually) water. Alex and I went tubing and had a super time allowing the powerful currents of the Napo River to carry us. We went for a swim afterwards. Afterwards, Carlos took us to have a late lunch with some local family friends. The table mat consisted of a gigantic banana tree leaf, and the food was delicious. In the afternoon, I went my separate way from the others. Carlos dropped me off on the edge of the river and told me to wait there for Gregorio, the local fellow who would show me around the next couple of days. He didn´t know where Gregorio was, or when he would come. There were five local teenage guys nearby, all friendly, and they gave me a few pieces of chocolate (made locally, from the seeds of the cacao trees along the Napo River). I waited in the sun for an hour, and eventually Gregorio appeared out of the forest with a smile and an outstretched hand. Gregorio was a native of the region, fluent in both Spanish and Quechua. He had been taught a thorough knowledge of the rainforest by his father: how to trap and hunt the animals, and how to use the plants for medicinal and practical purposes. Right away, he showed me at least a dozen traps that he had set up in the forest. There were traps for birds, traps for rabbits, traps for armadillos, and even traps for big cats such as pumas. The mechanisms were simple, but Gregorio activated every single trap for me and there was no question in my mind that each trap was effective and lethal. After the traps, Gregorio took me to a blowgun range that he had set up. A blowgun is a weapon traditionally used by the indigenous people of the Amazon to hunt small game, such as monkeys, and consists of a hollow pipe that shoots darts using one´s own breath; often, the darts are dipped in curare or some other poison to paralyze the target. Curare works by blocking nicotinic receptors at the junctions between nerve and muscle, resulting in muscle relaxation and paralysis. Gregorio demonstrated the blowgun by shooting a wooden dart at a small styrofoam target about six meters away with a drawing of a bird on it. He hit the bird in the neck with his first shot, and then offered the blowgun to me. I missed a few times, but after ten attempts I finally hit that bird square on. Gregorio laughed and we continued on to his home. After ten minutes of hiking in the forest, we arrived. He introduced me to his wife and little son, Antonio, and showed me to my home for the night, a spacious wooden cabin in the middle of the rainforest with no other guests and a perfect view of the jungle. After dining with his family, Gregorio and I headed out for a nocturnal walk in primary Amazon Rainforest. What an experience! We were accompanied by a symphony of sounds created by an orchestra of grasshoppers, frogs, and monkeys. The sounds were everywhere; the forest pulsating, alive. Whereas I had seen many different vertebrates (fish, reptiles, birds, and mammals) in Galapagos, now it was my chance to see insects, and a few amphibians. Fireflies twinkled in the darkness surrounding us; fireflies are really winged beetles that produce light via bioluminescence, a chemical reaction involving a light-emitting compound called luciferin as well as oxygen, ATP, magnesium, and the enzyme luciferase. We saw grasshoppers with antennae twenty centimeters long, spiders the size of a fist, difficult-to-spot stick insects, and gelatinous salamanders - they were all there if you knew where to look, and Gregorio knew where to look. I took as many pictures and mental notes as I could, but two hours went by quickly. The next day, it rained in buckets. I had breakfast with Gregorio and his family, but it kept raining, so we delayed our next excursion until after lunch. Gregorio went to set his traps and I spent the morning playing soccer inside with his son, Antonio. After lunch, the rain let up, so we went out again. This time, I was to learn about the plants of the Amazon Rainforest. Gregorio showed me the different uses of many different plant species. As a medical doctor, I was unsure as to how effective some of the plant remedies were, but I could still not help but be impressed by most. I shall mention but a few. (1) The sangre de drago (dragon´s blood) tree - A cut in the tree bark results in a dark red sappy resin dripping out which, when applied to skin, dries and turns white, forming a barrier useful for treating bleeds, infections, and mosquito bites. It can also be used to treat a number of internal maladies. (2) The hongo fungus - A fungus that can be cut into sticky strips, and the strips used as band-aids (he showed this to me - it works). (3) The hoja de uvilla silvestre tree - The leaf of this tree can be used as natural sandpaper (he showed this to me too - it also works). Gregorio showed me so many other plants and their uses in three hours that to explain them all here would take too long. I documented as much as I could. His knowledge was not just limited to plants. At one point, Gregorio cracked open a tree branch and hundreds of ants stormed out. He licked some ants off the branch, and offered it to me. Why not. I tried some live ants and, surprisingly, they tasted like lemon! He explained that these were hormigas limon, or lemon ants. By this time, evening was setting in, so it was time for me to return to Banana Lodge. Gregorio showed me to a road that I could use to get to Misuahalli and I had a nice eight kilometer walk back to town in the fading sunlight. The President of Ecuador, Rafael Correa, was in town (one of a few politicians that I respect, more on him later), but I walked right by him without paying much notice - I was thinking of my time in the rainforest with Gregorio, which had been amazing. Over the next few days, I chilled out at Banana Lodge. Mornings consisted of lively discussion over breakfast - Eduardo and Ana always made breakfast for their guests, and it was an opportunity to meet the other guests that passed through the lodge. I met a chatty couple, Francisco and Marcela, from Guadalajara, Mexico. They had spent a lot of time in both Mexico and the US, and it was interesting listening to their opinions of each country. I also met Travis and Erin from the US and we went out for dinner the next evening. One afternoon, I walked along the Napo River in search of something Ana had told me about, something the locals called ¨The Big Tree¨. She said it would be easy to spot, and she was right. After walking for half an hour, a tree of epic proportions appeared over the jungle canopy, towering above the other trees. It reminded me of The Hometree from Avatar. The trunk was at least eight meters (24 feet) in diameter, and there was even a path cut in the jungle so that you could walk around the perimeter of it. After a few more days relaxing at Banana Lodge, I travelled to Quito, the capital city of Ecuador. I did not see many tourists in Puyo; it rained a lot with not much to do. Banana Lodge, a few minutes outside of Puerto Misahualli, was right beside the Napo River. It was inexpensive and the perfect place to relax. In Puerto Misahualli, a capuchin monkey scurries down the pole right in front of me. He then ran (well, more like waddled) across the street on two legs. My dinner of tilapia fish, yuca, and salad, with a batido to wash it down. I cruised down the Napo River on this boat with Carlos, Alex, Nat, and Cairo (plus two dogs, Bibi and Julieta). Carlos showed us around both primary and secondary rainforest. The large tree behind me is in primary rainforest. Having lunch with, from left to right, Alex from Spain, Nat from Ecuador, Carlos, and Cairo. Note the enormous banana leaf used as a table mat. We saw these two young fellows playing in a canoe. If it appears to be sinking, the reason for this is that, it is. Gregorio possessed a lot of knowledge about the Amazon rainforest. He is showing me one of his more basic animal traps here. Note the spikes in the pit. When the trap is active, they are laced with poisonous curare. During our nocturnal walk, grasshoppers were everywhere; they make many of the distinctive sounds heard in the rainforest at night. I saw this fist-sized spider on our nocturnal walk. A stick insect at night. I played a bit of soccer with Antonio, Gregorio´s son. He´s cheating. The sangre de drago, or dragon´s blood tree, has a dark sappy resin, but if you rub it on your skin it changes consistency and turns white. It is used for bleeds, infections, mosquito bites, and a variety of other purposes. The hongo fungus is an effective natural band-aid. The bottom of this leaf from the hoja de uvilla silvestre tree can be used as natural sandpaper. It does the job well. Part of the trunk of The Big Tree. If you look hard, there is a 1.5 L water bottle at the bottom so you can get a feel for size. Breakfast at Banana Lodge with, from left to right, Marcela and Francisco from Mexico, Travis and Erin from the US, Alberto from Ecuador, and me. The bus ride to Quito was fun, I got to ride up front with the driver as a result of a mix-up with the tickets. We had a nice conversation. Compared to Guayaquil, Quito feels more structured and orderly. With a metropolitan population of two and a half million people, the city is smaller than Guayaquil, but it feels bigger. The beginnings of Quito date back to the first millenium, when the Quitu tribe set up a commercial center in the area. The Quitus were later defeated by the Caras tribe, who were in turn defeated in several battles by an army of 250,000 led by Tupac Inca (later on, of course, the Spanish defeated the Incas). With an elevation of 2,850 meters (9,350 feet), Quito is the highest capital city in the world containing full administrative, judicial, and legislative capabilities (La Paz in Bolivia is higher, but it shares capital city status with Sucre). The climate of Quito is dry. I took a bus into the city and walked around for a couple of hours before hitting my hostel, the Secret Garden, which had an invigorating view of the city from the top balcony (not to mention a lot of classic tunes from the late 70s and early 80s). For dinner, I met up with two girls from North America, Cordelia from Canada and Ashleigh from the US. The next day, I joined Cordelia and a couple of guys from Switzerland, Roland and Marcel, for a mountain bike excursion to Cotopaxi National Park, the central feature of which is Cotopaxi, a large active volcano. At a height of 5,897 meters (19,347 feet), Cotopaxi is the second highest summit in Ecuador and one of the highest active volcanoes in the world. It has erupted over 50 times since 1738, levelling the nearby town of Latacunga several times during that period. I just wanted to get a closer view. We were picked up in the morning by our guide, Alberto, and we drove for an hour to the base of the mountain with the bikes on the roof of our van. We then proceeded to have a sunny day of mountain biking. The biking itself was nothing too intense, with only a few technical downhill sections, but the scenery was what made the ride. We drove on what was essentially tundra, dry grassland with little else for vegetation, accompanied by incredible views of Cotopaxi and several other mountains for the majority of the day. During lunch, Alberto - a knowledgeable guy - spoke with us about Ecuador´s past, and also about the actions of the current government, especially in regard to Rafael Correa, the current president. A former economist, Correa was educated in Belgium and the US. He returned to Ecuador and took office in 2007, soon declaring Ecuador´s national debt illegitimate based on the fact that prior governments were corrupt (which they were), and successfully fought many creditors in international courts, reducing the debt. Since Correa´s government has been in power, Ecuador´s poverty and unemployment levels have fallen. There has been some contention (especially from western countries) regarding the plans of the Ecuadorean government to extract oil from Yasuni National Park, a park which contains more species in one hectare of land than in all of North America. The argument is strong, but there is a flip side: Ecuador needs this oil to develop revenue for more schools and education, as western countries have done before. I feel that anyone, anywhere, who drives a car probably cannot criticize Correa´s decision to extract the oil too harshly. His priority appears to be Ecuador, and it seems to me that he is trying to reduce the exploitation of Ecuador by others. Perhaps Eduardo Galeano would have approved. I spent the next day taking the ¨TeleferiQo¨ (capital Q intended), a gondola lift that runs from Quito up to the east side of Pichincha Volcano. It is one of the highest such lifts in the world. Me, Roland, Marcel, and other fellow named Marcus, from Germany, then ascended for almost two hours to a scenic lookout point on Pichincha. The view was worth it. My last day in Quito was relaxing. My reflections were at an end. A herd of cows blocks our bus for a few minutes on the way to Quito. Plaza Grande, the principal and central public square in Quito. The top balcony of our hostel, the Secret Garden, boasts a terrific view of Quito. The start of our mountain biking excursion, from left to right, Roland from Switzerland, me, Marcel from Switzerland, and Cordelia from Canada. During the ride, we were surrounded by beautiful views of Cotopaxi, one of the highest active volcanoes in the world with an elevation of 5,897 meters (19,347 feet). A brief rest, with a different mountain in the distance. One summit of Pichincha, with Quito in the background. The elevation is 4,700 meters (15,419 feet). In general, if one had time to only visit one country in South America, my feeling is that Ecuador is the best choice. It is compact and easy to experience islands, beaches, mountains, and rainforest without travelling too far, and the country is, except for Galapagos, cheap to travel within. On a different level, after seeing all those free animals in the Galapagos Islands and the Amazon Rainforest, my awareness increased in Ecuador: without freedom, life is a shadow. At any rate, I was thrilled to finally be moving on to my next country, one that, like Argentina, I knew little of yet intended to learn as much as possible about: Colombia.